Carrasco Norte is a striking contrast to the affluent suburb of Carrasco, with its rundown buildings and tumbledown shacks, marking it as a lower-class district. The neighborhood is among those being watched by law enforcement agencies as a high crime and illegal drugs zone. There are plans to develop 32 hectares into a residential area. Portónes de Carrasco is along the Avenida Bolivia and Avenida Italia, a commercial district with a shopping mall and a wide variety of stores that sell everything from clothes and books to electronics. 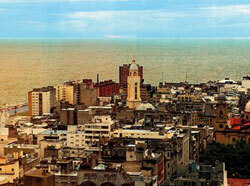 It is also the site of one of Montevideo’s best theatres. The neighborhood is being developed into a residential area, with apartment buildings and complexes such as the upmarket Alamos de Carrasco going up in recent years.